It’s not only splitters that get in on the action either. Some taxonomists have argued that Fungi and Animalia are part of a single kingdom, Opisthokonta, based on several shared characteristics found nowhere else in Eukarya. Even in a recent paper that attempted to resolve some eukaryote phylogeny into a succinct 6 kingdom system, there are still a few lonely branches, that don’t quite fit anywhere else. This is all leading up to the fact that high level taxonomy is messy. It is a system we’ve developed to understand evolutionary relationships among organisms, but it is an imperfect view of reality. So we shouldn’t be surprised when new groups appear whose classification may be ambiguous. Cryptomycota – the new group described by Jones et al. (2011) – is exceptional. Now, to be fair, it’s not going to turn our conventional view of taxonomy on its head. 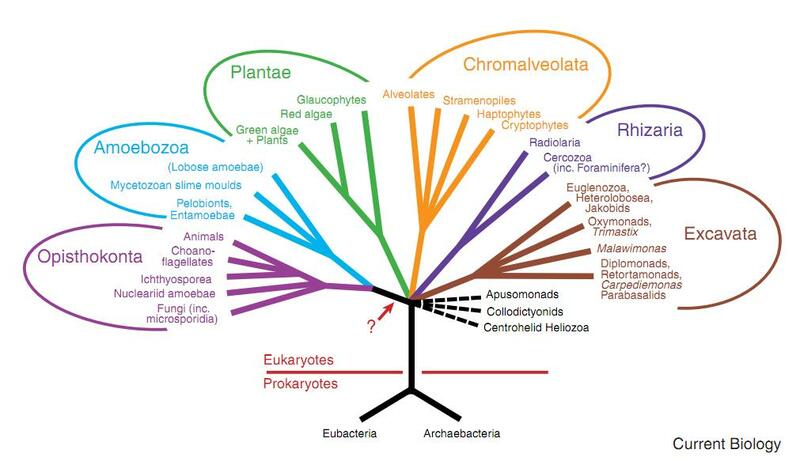 Cryptomycota is an addition to the tree of life, not a deletion or revision. What is truly exciting is that an entire new group of organisms, potentially as diverse and broadly distributed as Kingdom Fungi, has only recently been discovered. Most of the time, when major changes to the tree of life are made, it is because of new data, new analysis tools, or the discovery of a few new species that fill in some missing bits. When the now-defunct Monera became Archaebacteria and Eubacteria, it wasn’t because we had never seen an Archaen until the study, we just didn’t quite understand what Archeans were. To start, Jones and her team extracted environmental DNA from a host of diverse ecosystems using targeted primers to identify basal members of the fungal tree of life. What they discovered was that an entirely new group, only identified from molecular analyses existed at the phylogenetic tree’s base. This group was discovered in many different ecosystems, including deep-ocean sediments, freshwater lakes, rhizospheres, aquifers, and even chlorinated drinking water. There are thousands of microbes that are known only from molecular studies and have never been seen. They comprise an invisible biosphere and may have major ecosystem functions, but without any ecologic data, it is almost impossible to assess the importance of these microbes. Using their molecular data, Jones et al. design florescent probes that bind to DNA and cause the target organism to fluoresce under specific lighting conditions. With these probes, they were able to visually identify Cryptomycota in environmental samples and begin to infer characteristics of their biology. Three life-stages have been so far identified in Cryptomycota. They have a cyst stage, common to many fungal groups, a free-swimming zoospore stage, and an attachment stage, where they are found attached to a host organism, often diatoms. There may, and probably are, many other possible life stages, and with a group this diverse, there may be several different development strategies. Curiously, so far all observed Cryptomycota lack a chitinous cell wall, a trait diagnostic of Kingdom Fungi. The next big debate over this group is whether or not they actually are fungi. Because Cryptomycota lack this characteristic, and because the group is as diverse as Kingdom Fungi, it is likely that this group has the potential to be classified as its own kingdom. With regards to cryptomycota being new, Rozella was described in 1872, and environmental sequences from the group have been known for some years; that they are basal to fungi has also been reported; what appears to be new is the isolation of a member of the group other than species of Rozella. Thanks. I was under the impression that cryptomycota was being classified as a sister clade to Rozella, since the cryptomycetes lack a chitinous cell wall, while Rozella possess one in some stages (albeit secondarily acquired)? In their tree, Rozella appears *within* the new Cryptomycota, but part of a mysterious subclade of environmental sequences that are indeed fairly deep branching. Especially if Rozella secondarily acquired a chitinous wall, it can be anywhere, not necessarily basal. New phyla/’kingdoms’ get discovered all the time, though usually they’re not as close to things we all know about so no one really cares. [Pico]biliphytes are a recently discovered (2007 I think) very *deep* sizeable clade of teeny tiny planktonic eukaryotes, and we don’t even know whether or not they’re photosynthetic. There’s also a bunch of cryptic deep branching stuff that’s in certain evolutionarily relevant places, but those areas of eukaryotic phylogeny seldom attract taxonomists so they don’t ever get a “new kingdom! !1!” status. I wouldn’t be too shocked if there’s more stuff there between Nucleariids and fungi sensu stricto… awesome finding nevertheless! Also, the Supp Fig 6 have a life cycle of LKM11-01 tagged for chitin “depicting the absence of a chitinous cell wall from LKM11-01 cryptomycota cells during the cyst, flagellate, and attached stages of the lifecycle”. Apparently this is part of the environmental clade detected with Rozella, see Lara E, etal. The Environmental Clade LKM11 and Rozella Form the Deepest Branching Clade of Fungi, Protist(2009), doi:10.1016/j.protis.2009.06.005. Paywalls, the bane of science communication. I can send you the .pdf if you like. As Psi said above, the Rozella branch doesn’t have very strong support, so it may be part of or sister to Cryptomycota. Right now it’s excitingly ambiguous. I love the whole invisible biosphere stuff. the tree of life could be orders of magnitude bigger than anyone ever realized. Pity they’re all so small.